Mount Victory Community Development Association FRIENDS OF THE PARK committee is helping with the effort to update the Mount Victory Park in conjunction with the village. Please consider donating to our effort – it is your park, please help! 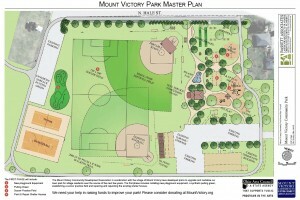 The Mount Victory Park Plan is an ambitious outline for renovating, updating and improving the park. We need all hands on deck to make it happen. The plan came after a lengthy public survey process to find out what kinds of improvements residents wanted. They include: new playground equipment for toddlers thru tweens, ball diamond security lighting, batting cage, concession stand, upgrades to shelter houses, picnic tables, new grills, upgrade walking path, landscaping including east border hedge, modular soccer goals, synthetic putting green, benches, splash pad, basketball & tennis court upgrades, performance area, shuffle board, corn hole areas and permanent recycling containers. We want to thank the Ohio Arts Council for helping fund the Master Plan for the park. Now the CDA is in the process of seeking donations and grant writing in order to raise funds for the improvements. The master plan is a roadmap to help guide the updates and renovation of the course of the new few years. As funds become available, installation and updates will be made.